Welcome to our website. We appreciate your visit. Schroeder & Lezamiz Law Offices, LLP was established in 1981 in Boise, Idaho and since that time has provided quality legal services to individuals, families, businesses, cities, counties and universities. Our law firm has received the AV rating from Martindale Hubbell, which is the highest rating given to law firms in the United States.Our attorneys are admitted to all state, federal, and bankruptcy courts in Idaho; the 9th Circuit U.S. Court of Appeals; as well as other state and federal courts and administrative courts. One or more of our attorneys are admitted to the United States Supreme Court. 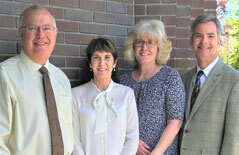 Our attorneys are community leaders in Boise and the surrounding area. Please feel free to contact us regarding your legal questions. Provide as much information as possible regarding your inquiry. While this contact does not serve to establish an attorney/client relationship, it will allow our legal team to begin an assessment of your case. We are committed to helping you through disputes with sensitivity, confidence and efficiency. Our attorneys strive to resolve conflicts through mediation and arbitration, reducing the stress and financial strain that accompanies trial. But you can also be confident that our seasoned litigators will not hesitate to take your case to court if that would better protect your rights and interests. Contact Schroeder & Lezamiz Law Offices, LLP today. Call Schroeder & Lezamiz Law Offices, LLP at 208-384-1627 or contact us online to schedule your initial consultation. Se habla espanol. Schroeder & Lezamiz Law Offices, LLP serves clients throughout the Western United States: Idaho, Nevada, Oregon, Wyoming, Utah, California, Colorado, Washington, Arizona and Montana. formal legal advice nor the formation of a client/lawyer relationship.